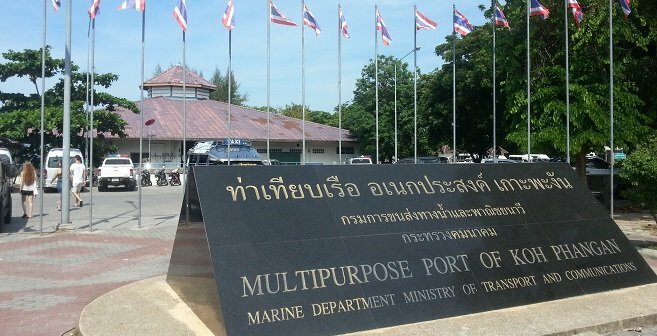 There are five companies operating direct services from Koh Phangan to Surat Thani Airport: (1) Raja Car Ferry Company, (2) Phantip Travel Company, (3) Lomprayah High Speed Ferry Company, (4) Seatran Discovery Company, and the (5) Songserm Company. The quickest service takes 3 hours 15 minutes, and the slowest takes around 5 hours. Tickets prices range from 540 THB per person to 850 THB booked online. Compare ticket prices and travel times. The journey takes 5 hours 00 minutes with the Raja Ferry Company. The ferry journey is two and a half hours. This is a car ferry which is the slowest of the various ferries operating on the route from Koh Phangan to Donsak on the mainland. This company has newer and older ferries. The newer ones are better. Both types of ferry have a shop where you can buy drinks and snacks, toilets and comfortable seating. On arrival at Donsak ferry pier on the mainland you transfer to a bus to Surat Thani City, a journey which takes which takes approximately an hour. From Surat Thani city it then a 45 minute journey in the same bus, or sometimes a minivan, to the airport. The scheduled times leave make little allowance for connection times and bad traffic. Allow for this service to be up to an hour late arriving so that you do not miss your flight. Service: The Raja Ferry company will take you all the way to Surat Thani Airport from Thong Sala Pier (Koh Phangan’s main port) by ferry and then by bus. Journey Time: 5 hours 00 minutes. The Phantip Travel service is virtually identical to the Raja Ferry service for an additional 100 THB on the ticket price. Some people prefer the Phantip Travel service over the Raja Ferry service because Phantip Travel use a large bus to take passengers from the ferry port to the airport, whilst the Raja Ferry Company uses a minivan. You may also find that the travel times of the Phantip Travel Company are more convenient and therefore the extra 100 THB per person is worth paying. Service: The Phantip Travel company uses the same route as the Raja Ferry Company, and Phantip Travel customers also sail on the Raja Ferry. Journey Time: 4 hours 30 minutes. 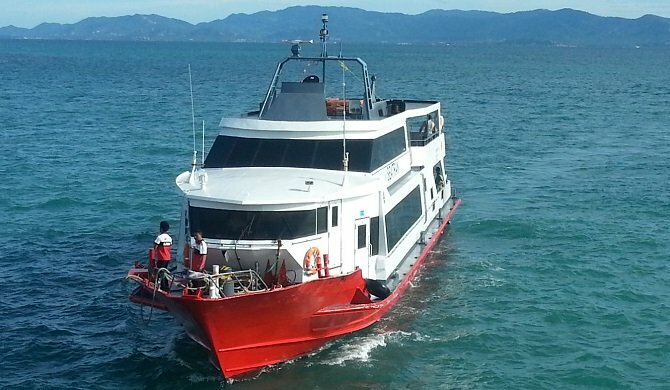 The Lomprayah High Speed Ferry Service is the most popular transport provider for the Koh Phangan to Surat Thani Airport and they often sell out of tickets in advance of the day of travel. The Lomprayah service is particularly busy around the time of the monthly Full Moon Party on Koh Phangan, and in the high season months of January, April and August each year. The services is fast. The Lomprayah Company does the journey in 3 hours 15 minutes, which is 1 hour 15 minutes quicker than anyone else. The ferries and buses they use are modern with good facilities. The staff are helpful. This is the only ferry service where they carry your luggage on and off the ferry for you. The Lomprayah Ferry has a fleet of 7 high speed catamaran ferries. The largest ferries have a roof top sun deck and seating for 461 passengers as well as 6 toilets and a small shop selling hot and cold drinks, snacks and sandwiches. Service: The Lomprayah service goes direct from the pier in Donsak to Surat Thani Airport. Journey Time: 3 hours 15 minutes. The Seatran Discovery Company has comfortable boats and luxury buses. But provides the slowest service from Koh Phangan to Surat Thani Airport. The ferries which the Seatran Discovery Company uses are fairly comfortable with air-conditioned cabins, outdoor seating and a shop selling drinks and snacks. This is a great service, however, it takes longer than necessary to travel from Koh Phangan to the airport in Surat Thani because they make passengers wait for connecting bus services from Surat Thani City to the airport. Service: The bus service from the ferry pier in Donsak travels to Surat Thani Airport via the Seatran Discovery Office in Surat Thani town. 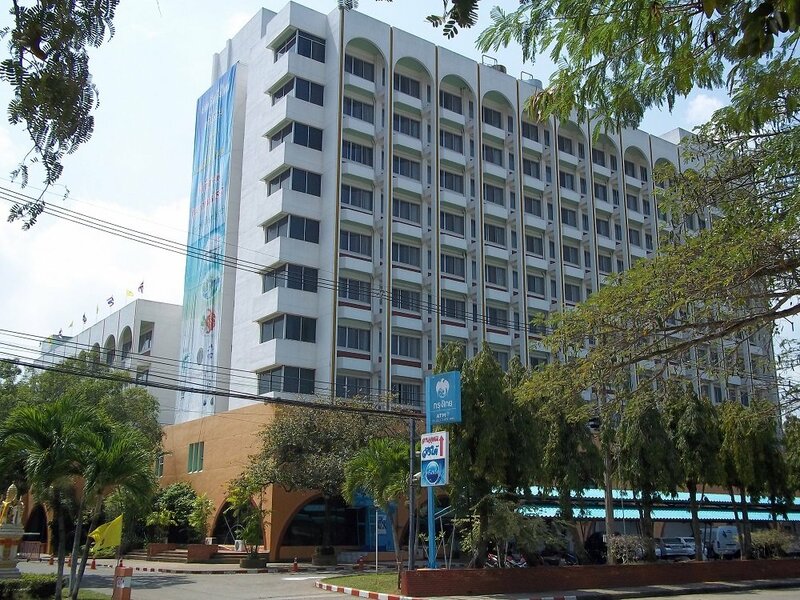 A word of caution with this journey: if your flight is before 11.00, you will need to travel to Surat Thani the night before and stay in a hotel. For flights from Surat Thani Airport the minimum time you must arrive before the plane is scheduled to depart is 45 minutes. Arrive after this and you may miss your flight. The Wang Tai Hotel is both large and modern. Travel in Thailand is frequently subject to delays. This is particularly the case when boat journeys are involved. The weather in the Gulf of Thailand is changeable and in rough seas the journey can take longer than expected. To avoid missing your flight when you travel from Koh Phangan you need to leave yourself extra time. All services from Koh Phangan to Surat Thani Airport depart from Thong Sala Pier. 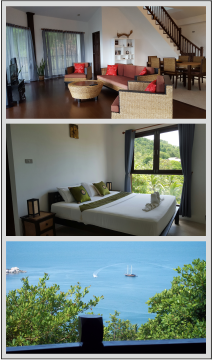 ♦ From 35,000 THB per month. ♦ 3 bedrooms, 3 bathrooms, lounge and kitchen. ♦ Located in Thong Nai Pan Noi.